To get started with Breathe, you will need to import your employee data into your account. This article goes over the steps to easily get your information into Breathe. Don't panic! You do not need to add each of your employees individually if you have lots of employees to add into the system! Instead, we have provided you with a handy spreadsheet which you can fill out with as little or as much information as you like. 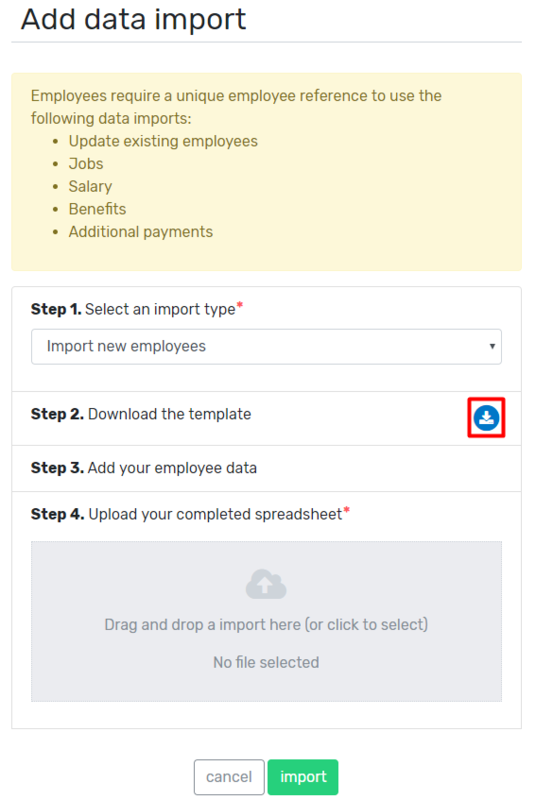 Simply select 'Import new employees' from the drop down menu and use the download icon to download the import spreadsheet. When filling out the spreadsheet it will ask you to fill out the employees reference, name, email address and their join date. The rest of the fields are optional, so you can fill out as much or as little as you like. There are also other reports to allow you to quickly add employee information to Breathe. These include jobs, salary, benefits and additional payments. If you have forgotten to add any information on your initial employee import then no worries! You can simply use the 'Update existing employees' import to update any employee information. Make sure your import type is select before you add your completed spreadsheet. For example if you are uploading a "Job" import make sure "Jobs" is selected from the dropdown menu.